Nothing says rough-riding radio adventure like The Lone Ranger. 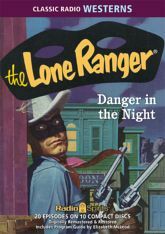 And nothing says The Lone Ranger like Brace Beemer as the Masked Rider Of The Plains, John Todd as Tonto, and Fred Foy as your announcer! Saddle up for twenty thrill-packed episodes of radio's favorite Western with the incorruptible hero who speaks with an air of authority, acts with unwavering integrity, and shoots with astonishing accuracy.